I mean this when I say it – you will never learn more about emergency preparedness, survival or SHTF in 11 minutes, than you will by watching the video above. Seriously the amount of tips, tricks and information contained in this video is mind boggling. If you watch this video (and I recommend that all K.W.N fans do watch it), I guarantee you will learn a load of new survival/SHTF tips and hacks. I just stumbled on the SpareOne Plus Emergency Cellphone Phone on Amazon and I thought this looks very interesting – an emergency/survival cellphone that runs on a single AA battery, which is included and has an amazing 15 years shelf life… Problem is that is just about all the information included on the Amazon listing, but I did a bit of digging and found the SpareOne website which has a whole load more information. Below are some of the features from the SpareOne website. Up to 10 hours* of talk time means you have plenty of connectivity hours to last you your whole trip on one battery. LED Torchlight (Flashlight) on top providing up to 24 hours of continuous light makes this phone several tools in one. Audible feedback provides audio feedback by audibly repeating the number dialed. This feature also audibly repeats operational messaging such as missed calls and keypad lock notifications. SOS torchlight the bright LED light located on top of the phone will flash in Morse code to show you’re asking for help or in distress. Simply hold down the SOS torchlight button for 10 seconds. Panic siren When in distress, utilize the loud audible siren by holding the volume button for 10 seconds, and the panic siren will aid in attracting attention. Location & alert services-capable* unlock the true potential of SpareOne Plus by activating the lifesaving Locate and Alert services! Credits Locate & follow SpareOne Plus, receive emergency alerts, and customize the SOS button, guardians, and speed dial numbers. Extreme weather operating range (-22F to 140F) impressive for a basic mobile phone, and even far greater than that of a smartphone. The SpareOne Plus Emergency Cellphone currently costs $68.61 on Amazon (which is $11 cheaper than on the SpareOne website) and I think it is fair to say this would be an excellent investment for emergency preparedness, bug-out-bags etc and anyone who goes out into the great outdoors camping, hiking, hunting, fishing etc. This is a truly a ‘purchase it, pack it, and forget it’ until you need it survival gadget. These survival life hacks from HouseholdHacker! are all quick and simple to do, the whole video detailing all seven hacks, only lasts two minutes or so. Take a couple of minutes and watch the video above, it might just save your life one day! Firstly – please note the words ‘In An Emergency’. This works but it could get you in trouble if you abuse the technique. This post isn’t about showing you how to power and charge your USB devices via the phone line for free. This cable set-up should only be made for use in the event of a SHTF emergency scenario. I am not sure about this, but there may still be power running through your home phone line, even if the phone is disconnected. You would have to check to be sure though. It is pretty cheap and easy to make up the cable used in the video above. It might be worth making one up now and storing it with your emergency supplies, as it may come in handy one day. It is simply not worth doing this daily and abusing the free power – the trouble you could get in is way out of proportion to any benefits gained. I highly recommend that everyone carries some hand warmers with them when going out into the wilderness. Just try lighting a fire, tying a knot or pulling a trigger with numb hands. A hand warmer can literally save your life. People have died with dry tinder, wood and matches, just because they couldn’t strike the match because their hands were so cold and numb. I know what you are probably thinking – the hand warmers you can buy are pretty cheap and they work well, but thing is we focus on prepping and self-sufficiency, store brought hand warmers might not always be available, and hey – it’s fun to make stuff anyway! 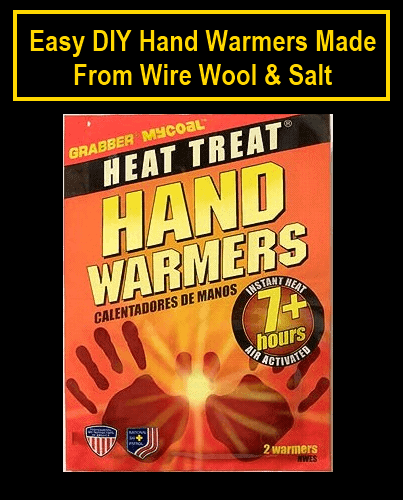 There are quite a few recipes for DIY hand warmers but they usually require iron powder or iron fillings and both of these can be expensive and difficult to acquire, which then makes it not really worthwhile doing. However I have been doing some experimenting and I have found that you can substitute the iron fillings/powder for wire wool, which is cheap and easy to acquire! The hand warmers don’t heat up quite as much as when using iron etc, but they still do the job. Firstly it is vital to keep everything dry as it is moisture which activates the hand warmers. You need to cut up the wire wool as small as possible, we are literally talking powder is best here. I pulled it apart and cut it up a bit and then used an old blender to make it very fine. You also want the salt to be as fine as possible so grind it or pulverise it as small as possible. Basically the smaller/finer you can get both the wire wool and the salt the better. Now mix the salt and wire wool and then add the charcoal and mix again and store in your resealable bag until required. Be sure to store in a dry place! To activate, add 1 teaspoon (give or take) of water, seal the bag and then shake and squeeze to mix. Be sure to trial/check one of your DIY hand warmers before taking them out into the wild. If they do not generate much heat it is likely you have not made the wire wool and salt fine enough. You can also experiment by slightly altering the amounts of wire wool and salt. Now go and make some with your kids! A prison lighter is an improvised homemade lighter made using just an AA or AAA (you can use other larger batteries too!) battery and a gum wrapper. In prison they are used to light cigarettes etc, but they can equally be used to start a fire in a survival situation. Fire is pretty vital to survival for warmth and sterilizing water etc. If you have or find a battery and a gum wrapper etc, you can start a fire with a homemade lighter like this. Watch the video above and find out how to use a battery and the gum wrapper to make a simple prison lighter, then throw some gum in your pack or bug-out-bag. Funnily enough when I was kid my Dad used to fix up cars; I was playing in the trunk of one when I was around five or six, and I did actually mange to lock myself in the trunk. I remember being terrified and it seemed like it took ages for my Dad to hear my screams and let me out. Find out how to escape from a trunk below, then teach your kids! Luckily the great guys over at ‘ITS Tactical’ have created an awesome knot tying post which shows how to tie 5 of the most common and important knots you are likely to need. There are how-to videos and loads of great step by step photos showing how to tie each knot. Check it out below!